When I arrived, there were a dozen people already waiting under an awning, shielding them from the morning rain. The weather report called for showers on this morning only, so I wasn’t too worried. I got my ticket and loaded my pack onto the boat. As I waited under the awning myself, I checked out the other backpacker's gear, eavesdropped on stories about their previous trips to the island, and watched the workers load several kayaks onto the ship. Once allowed to board I sat by the window at a table with four comfy blue seats. 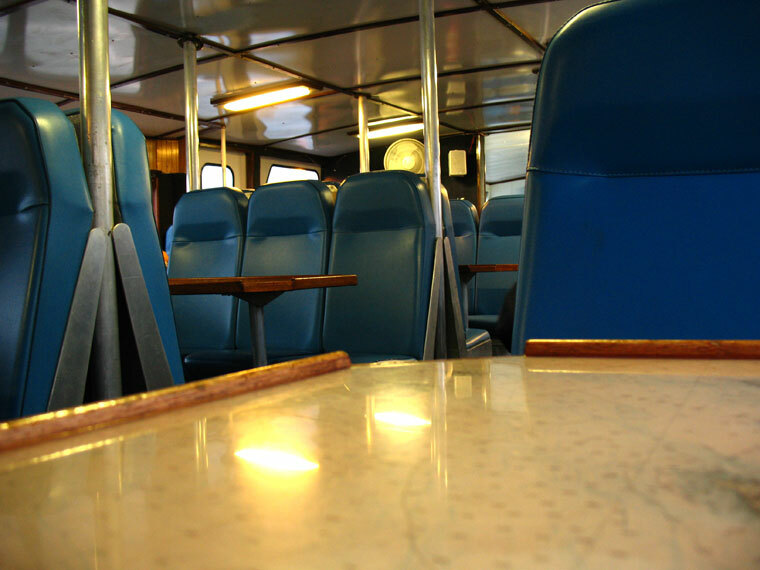 I knew the boat would be close to full and wouldn’t be able to keep my own table. I was ok with that, since most people were backpackers, I figured I’d get to meet someone that had common interests. Instead, however, a couple of about 18-20 years old asked if they could have the seats across from me. The girl painted in make-up was obviously more interested in how she looked than the other rough looking backpackers on the boat. Her boyfriend constantly yawned and rubbed his eyes. We didn’t exchange a word after “mind if we join you” and they soon fell asleep. The boat was a couple minutes from leaving. What is this diamond shaped thing in my pocket I wondered, a keychain? My goldfish memory eventually kicked in and I realized I had forgotten to drop the key off at the motel front desk. I told a girl who worked on the boat the situation, pointed to the motel, and asked how much time I had. “Hah, none.” she said. “But if you hurry, you can make it.” The engines started to rev up. The 30 seconds to drop it off and get back on the boat turned out to be a blessing in disguise. I could now scurry past my sleepy shipmates unobserved, onto the stern’s deck outside, where I would spend most of the 3 ½-hour trip. I leaned against the railing looking out over the side. Michigan disappeared. The horizon and Lake Superior was all I could see in any direction. It was cold. Every so often a chilly mist sprayed from windblown white-capped waves. 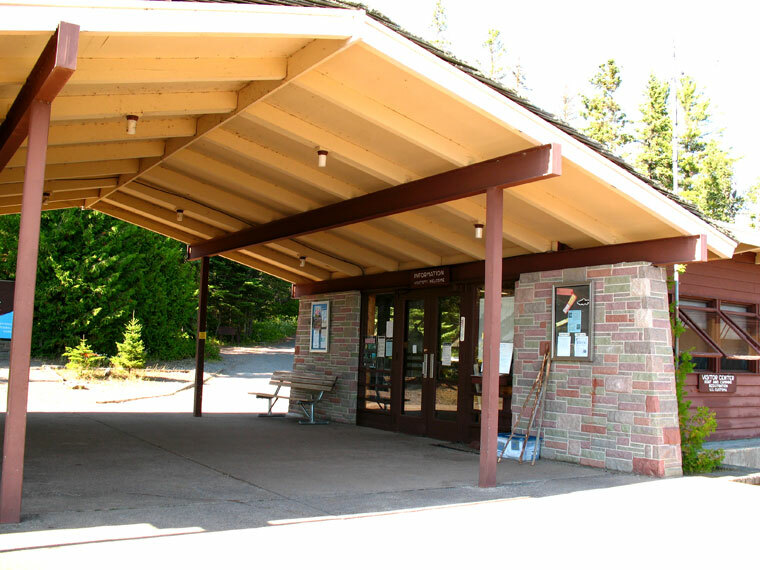 I staggered to the snack bar, trying to walk on a surface that rolled and swayed, and bought a cup of hot cranberry apple cider to warm up. 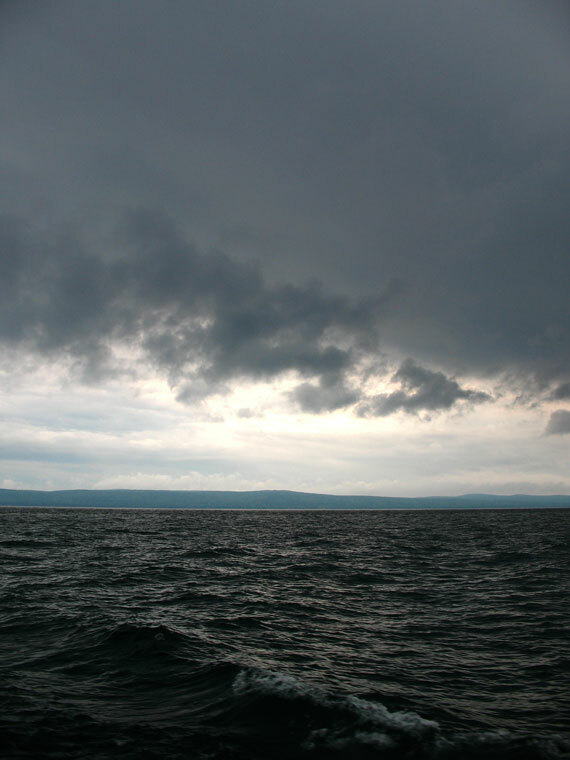 I moved onto the bow of the ship I stared at the horizon waiting for an island to emerge. 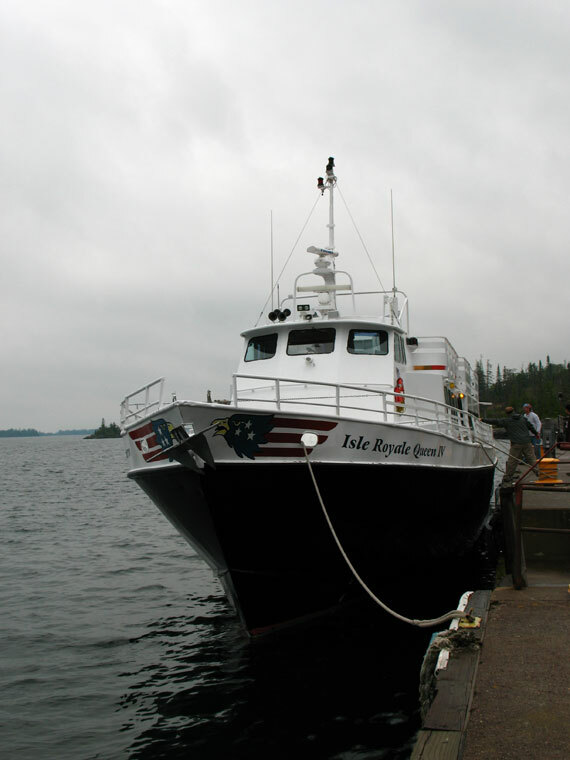 The voice of the captain occasionally bellowed out of a speaker to tell us some information about Isle Royale that we may find useful or interesting. He tells us this year is the 50th anniversary of a moose/wolf study on the island. The populations of moose and wolves fluctuate like a teeter totter. As the predator wolf population goes up, the moose prey population goes down. With the food source low, the wolf population goes down until the moose population is back up, then repeat indefinitely. That is a simplification but you get the idea. He says there are 23 wolves in 4 packs and 650 moose on the island; a low number for Isle Royale but still almost ensures I’d see one. I’m not sure why I like this animal but I think it just conjures up images of the Alaskan wilderness and boreal forests that I love so much. He tells us the story of a moose that ventured into a campsite drawing the attention of excited backpackers. Wolves came into the camp and attacked it. The moose tried to flee by jumping in the lake but drowned. The wolves pulled the body back into the camp and begun devouring it, in front of some, I assume now, horrified, shocked, and disgusted backpackers. Since it was disturbing people, and the wolves would be there for a while feasting, they evacuated the area. A week later, the pack finally finished their meal and, umm, lived happily ever after? I looked around at the other passengers and confirmed that they had the same, “what the hell?” look on their faces that I did. I’m not sure of his point to the story, but he seemed to enjoy telling it. I’ve read several times that wolves are not a threat to humans. After his story, I started to question my sources. Finally, Isle Royale appeared in the distance. Waves crashed on its rocky shore painted with bright orange lichens. The forest looks like those you expect to see north of the Canadian border, with conifers like white spruce and balsam fir and younger deciduous trees like birch and aspen. There is a good reason for this. 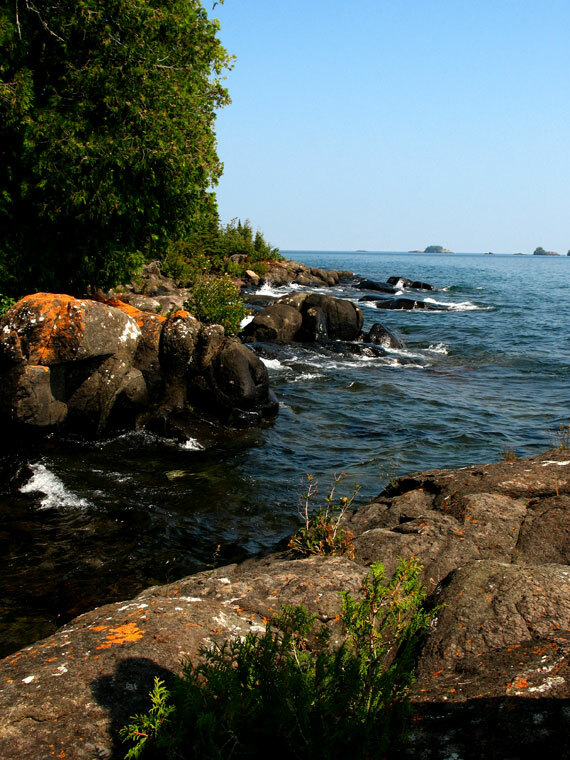 Isle Royale is just barely at the southern tip of the Boreal forest, rarely seen in the lower 48, that covers millions of acres in Alaska and Canada. There was a quick orientation and registration with Ranger Marcia before heading into the wilderness. I could tell she had a love affair with this place. I imagined that she would occasionally head off into the woods alone, during off-hours, and eat edible plants and berries along the trails. I pictured her finding a rock to sit on, with a good view, while writing poetry about how she feels connected to nature, complete with metaphors that give the island human-like traits. She was my kind of person. I decide to head to Daisy Farm campground just over seven miles away. My first impression of the trail running along the shore was that it seemed meticulously landscaped. 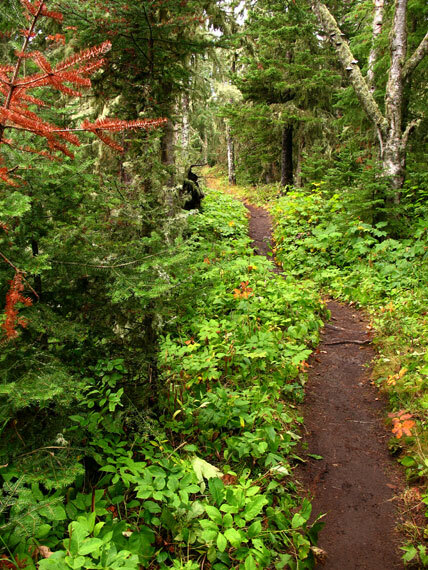 The placement of large and small-leafed plants, moss covered boulders and bedrock, wide assortments of wildflowers, edible thimbleberries right at arm’s reach, were all under a canopy of trees that flowed with the trail just as it should with nothing out of place. 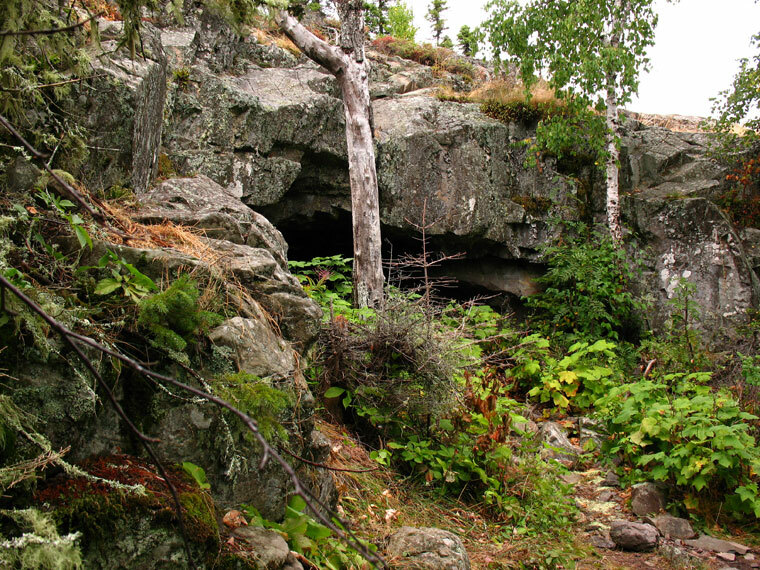 This was especially noticeable in places I decided to stop for short breaks, like at Suzy’s Cave, and along Lake Superior’s rocky shoreline. 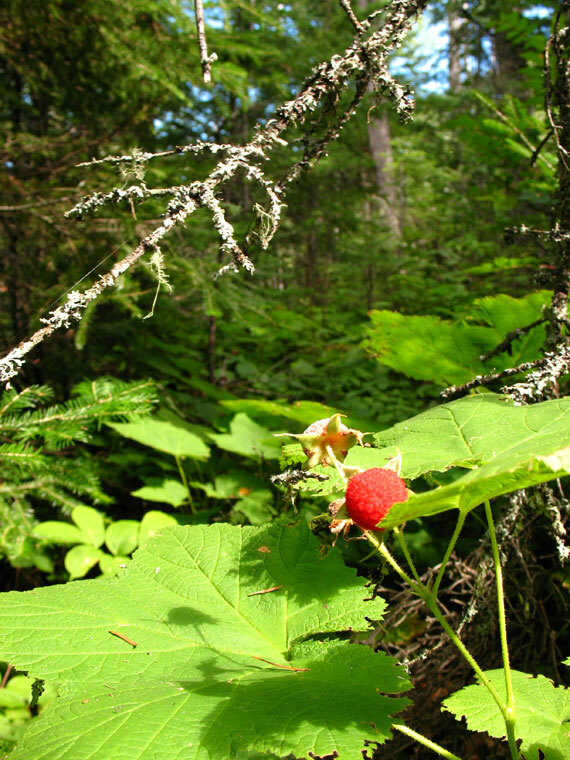 I picked several thimbleberries along the trail. I got somewhat addicted to them. They look like raspberries and the taste reminds me of pomegranate. They get their name from the shape, but to me, they looked more like little red berets on the ends of my fingers than thimbles. I put them on my fingertips like when we’d put those pointy Bugles snacks on our fingertips as kids. We’d pretend they were witches nails, and walk around with our hands up near our face, fingers curling, cackling, and saying things like “I’ll get you, my pretty, and your little dog too”. Once my index finger had on a red beret, suddenly I imagined it had a French accent (I really didn’t have a choice, it just happened.) Beret Wearing Index Finger doesn’t care much for vile, despicable, American scum. Beret Wearing Thumb tried to do a ‘Rerun from What’s Happening’ impersonation but all he knew to say was “Hey, Hey, Hey!” although I had my doubts that that was Rerun’s catchphrase on the show, but I kept my comments to myself. Beret Wearing Pinky just incoherently yelled things like” Viva La Revolucion!”, in a high-pitched futile attempt to sound threatening, but nobody paid attention to the pinky. They never do. This just fuels his desire for revolution. I ate so many thimbleberries that my fingertips were dyed red, the sign of true addict. This dialogue only took place in my head. Does that make it less odd? 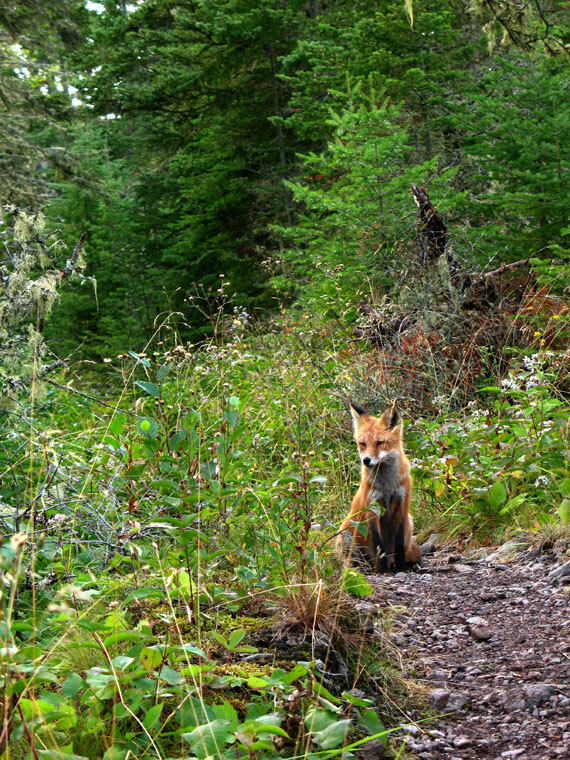 Nearing Daisy Farm, hiking up a slight incline, I encountered a nonchalant red fox standing in the middle of the trail. He stood staring at me. I quickly got out my camera to take pictures. Not concerned in any way, he just sat down on the ground looking around in different directions, almost as if he was posing. After eight or more photos, he remained unmoved. After finally putting my camera away it seemed as if he might said, “Ok, now that I have your attention please answer me these riddles three and you may pass.” As another noisy group started to approach behind me, he strolled away from the trail slowly and out of sight.